Reliance Securities is one of the largest full service broker in India. 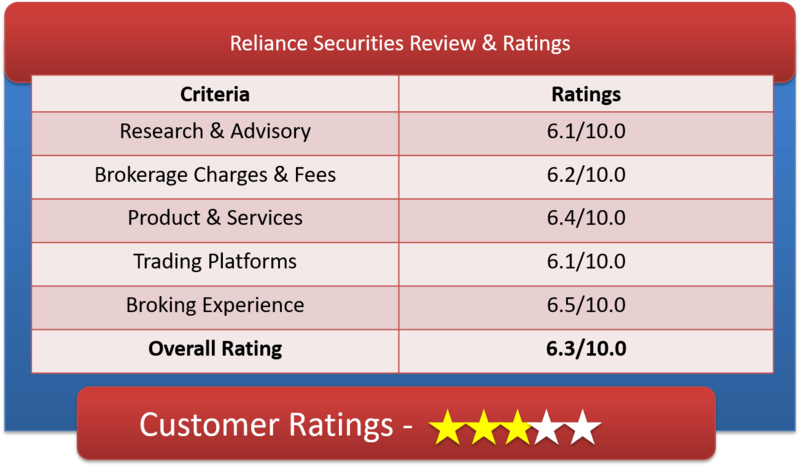 Lets have a detailed Reliance Securities Review & understanding of Reliance Securities Demat Account, Reliance Brokerage charges, RSec Trading Platforms & other important features. Reliance Securities is the broking firm of Reliance Capital Group of Anil Ambani. The Reliance Capital Group as a whole has presence in many financial fields that includes asset management and MF; equities and commodity; both life and general insurance; wealth management; distribution of financial products; asset reconstruction; commercial finance; proprietary investments, etc. Rsec is a well-established and highly reputed Brokerage firm. The Broker is a corporate member of NSE and BSE and has a huge network through branches across all over India and has around 6.5 lakh active customer base. The Broker offers online trading with its in house secured website trade.rsec.co.in. You can also trade through variety of means including live Chat. Call & Trade, Branch Dealing Desks network of affiliates, etc. are other options available to you. When reviewing Reliance Securities customer service, we expected great results as it is a big name and that’s not exactly what we discovered at the end of the tunnel. The Broker doesn’t have good reputation as far as customer service go. The management tries to handle the traffic but fails to have adept team. Brokerage is average cheaper than the big shots but is at par to most of the average brokers. Reliance Securities offers a variety of Brokerage plans to choose from as per your trading style. Their R-Fixed Plan is the most basic plan. Here you pay fixed brokerage charges. The brokerage charges are as per market standard (With reference to Full service brokers). Delivery – 0.50%, Intraday – 0.05%, Future- 0.05%, Options- Rs100/- per lot. R-Fixed Online plan is right for you. The brokerage is lowest in this plan and a good fit for online traders. Delivery – 0.40%, Intraday – 0.04%, Future- 0.04%, Options- Rs100/- per lot. Reliance Securities RMAX Plan is especially designed for more active investors. You have to buy a subscription for this plan. After this your brokerage rates get reduce during tenure of the plan to have taken. The fourth plan is R-Flexi Plan- This plan is like I-Saver Plan of ICICIDirect. Here you can pay low brokerage only if your trading volume is high. Refer the below brokerage charge for NSE/BSE Cash that ranges from 0.60% (for monthly turnover of less than 10 lakhs) to 0.15% for turnover more than 2.5 crore. MIS – 5 times exposure in cash segment, 6.5 times in stock futures and 10 times in index futures. Plus Multiplier (MIS) -offers approximately 10 times exposure in cash segment, 8 times in futures and 15 times in index futures. Super Multiplier(MIS) – offers approximately 10 times exposure in cash, 10 times in stock futures and 18 times in index futures. NRML CASH – Offers a facility to take a delivery position by paying the required margin during the day and pay the balance not later than 5 days from the exchange payout. How to Open Reliance Securities Demat Account? Why Open Reliance Securities Demat Account? Research Service – Finest quality research. The broking house provides its clients software based, web based and mobile app platforms for trading. Application powered by ‘Omnesys NEST Trader’. It is fully functional trading terminal allowing fast execution of orders with real time monitoring. An advanced online trading platform of Reliance Securities that has integrated market watch for equities and Derivatives. This web based portal is integrated with analytical engine for better and calculated decisions making. Get live streaming quotes, real time news and market coverage, integrated research with fundamental and technical analysis. Charting tools, payment gateways and many more features comes with it. App that can be downloaded for trading on the go people. It comes with features like Real time quotes, live streaming market watch, balances and holdings lookout, access to real time charts on NSE and BSE, customized watch list etc. Reliance Securities provides you with After Market orders (AMO). The Broker provides an option to place Bracket Orders, NRML and Cover Order. With NRML you have flexibility to pay the remaining amount within 5 days (T+5) from the exchange pay out day. Reliance Securities is a very well respected broker, competing nicely among the largest available brands. As a full service Broker, they have a lots of value added services to enhance the trading quality. Biggest disadvantage is -Reliance securities is not supporting commodity trading. Big margin and option to pay within t+5 days. No 3 in 1 account. Lots of hidden charges when discovered you feel cheated.